Best Rifle Case In 2019 – Top Models From A Gun Enthusiast! When you like to engage in adventures that involve rifles, you as well know that having the best rifle case is important. So, if you've been searching for the perfect opportunity to get to understand rifle cases and finally purchase one for yourself, you may have just stumbled on the right post to take you there. We really enjoyed testing a number of rifle cases in our mission to find the best ones. As much as the cases are an old style, they keep evolving and becoming better to keep up with our changing needs. Here, we will take you through the best rifle cases available on the market today. Then, you will learn about the important elements you need to consider when buying one. 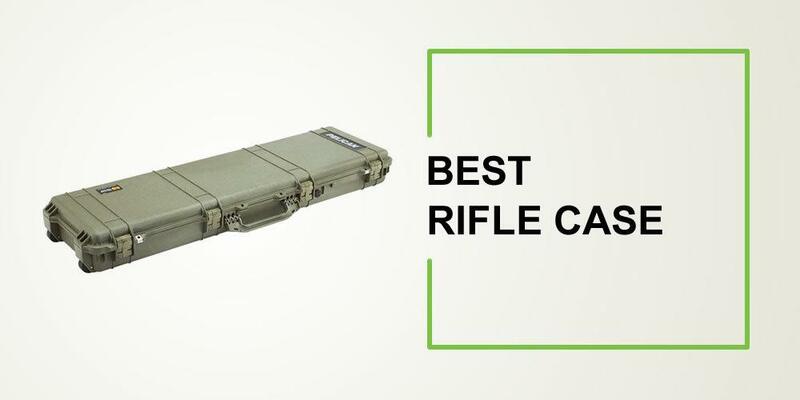 If you are on the lookout for the best rifle case, check out the following reviews. I have covered quality and durable rifle cases you would love to have. For example, the 1750 scoped rifle case is crafted from a combo of homo co-polymers. The walls of the case are tougher than usual. In fact, it's crazy how a strong case can be light. You expect it to be heavy, right? 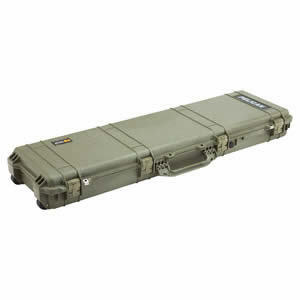 For the pressure-free souls, this rifle case has ball bearing wheels made from tough stainless steel. They are durable and will offer you a smooth ride even in rough areas. Most rifle cases are made with handles but some brands go an extra mile to make your life better. With a little touch of class, you get to enjoy both handles and backpack straps. It has two rifle cabins, one for the 36-inch gun and the other one for the 42-inch gun. Well, there is a thick padded dividing wall that will ensure the security of your rifles when you place them in your case. To add on that, there are a number of additional compartments where you can keep other things like your own travel stuff. The twin adjustable back straps are strong enough to enable you to carry your case however you like. You can run, jump and roll but your case won't fall off. When you don't want to have any trouble with the police or at the airport while carrying your rifle, then you need to get the pre-made AR15. Aside from accommodating your rifle, it has special spaces for magazines. The case comes with a full-size pistol plus its magazine, silica gel canister, and a waterproof accessory box. This also means there is no way water or dust can get to your rifle. Aside from that, the case has a pressure equalizing valve. This feature allows your case to sustain all the changing altitudes you may go through. AR15 also features heavy-duty latches incorporated in its construction to make sure that when everything is set inside, nothing will drop out. This means that your items will be safe and you will be safe from your rifle. For those of us who have really long rifles, don't feel left out every time you get a case and it's shorter. Don't feel like you made a bad choice by buying a long rifle. Condor rifle case is here to cater for us maximally. 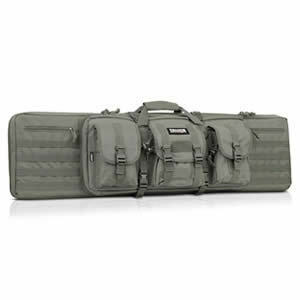 Therefore, you will have a fully padded rifle case that will protect your rifle in all ways. It has one big compartment that is technically 42 inches long. There is added 26-inch compartment that you can use to carry your pistol, optics or any other gadget you have while going out for war or rifle fun fire. Condor also understands that these long guns need to be cleaned once in a while. 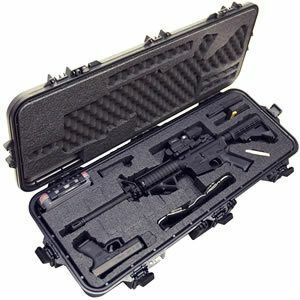 So, in this incredibly durable case, they went an extra mile to offer you triple modular pouches where you can use to store your rifle cleaning kit, rifle gear or any other item. Saviour has made some pretty good rifle products and their new equipment tactical double rifle bag is something to die for. 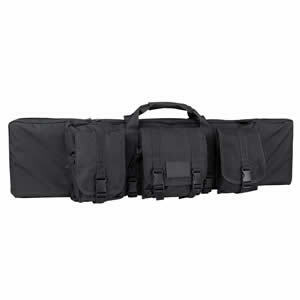 Unlike other rifle cases, this one will offer you multiple ways of carrying it. For example, you can carry it as a handle bag with the hook and loop fastener or adjust the padded backpack straps to carry it on your back and release your hands from pressure. Besides that, the rifle bag comes with strong and lockable zipper sliders. In fact, this is the coolest part of this case. There are double firearm compartments and Para-cord zippers to pull the lazy way. Apart from that, when you buy this amazing bag, you get to enjoy extra storage spaces. There are three additional external tactical pockets where you can keep your spare equipment and other accessories you may have. No weather condition should stop you from going out on gunfights. That is why you need a gun case like Plano gun guard. For status, it's an exceptional gun case that can take in any type of rifle. It's been designed in a manner that no rain, sun, snow or whatever harsh weather elements may come your way, will not be able to harm your rifle. With the Dri-loc seal, you can totally be sure that your gun will be safe from water, air, and dust. The bag has a rugged frame with hardened sides which are outstandingly visible due to the thick walls made from heavy-duty materials. The materials include stage, springs, latches and padlock tabs. These features are incorporated to ensure your own safety when carrying a gun. Rifle cases are designed to protect your gun. How do you ensure that you pick the right rifle case? Check out these tips. Having a soft-sided case means your escape from all the bulkiness but it also shortens your rifle's lifespan as well as putting your safety at risk. On the other hand, having a hard-sided case means your guns will stay put in their compartments, be durable as well as keep you far from harm. The material used to construct a case entirely determines the strength and weight of that case. Some of the commonly used materials include; aluminium, wood, and plastic. All these materials have their own ups and downs which you should really consider when purchasing a case. Being waterproof is the most lucrative feature on any rifle case because of its guarantees the unbeatable safety of your rifle from crazy weather conditions. But being waterproof doesn't really justify the quality of the rifle case. You should, therefore, consider the pros and cons of a waterproof case before buying one. The size of a rifle case depends on the size of your rifle and if there are any other items you intend to carry along your rifle. Such items include; magazines, pistols, and scopes. Also the number of rifles you need to transport as well as if there are other items of your own you may want to use on your adventure. 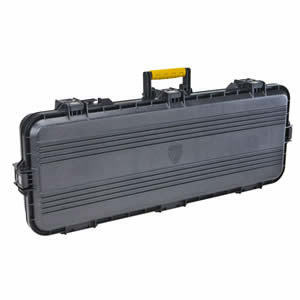 Most modern rifle cases are designed to be dustproof and moisture proof. That is why cleaning your case may be the last thing on your mind. But if you are considering getting a rifle case that needs to be cleaned, then you have to keep in mind how easy it is to clean the rifle case. Besides, you will have to get the items required to clean it. Q: Do they have backpack straps? 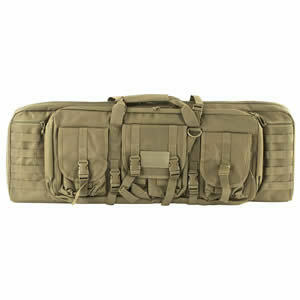 A: Most of the named rifle cases have backpack straps; in fact, they are highly adjustable and cushioned for comfort. Q: Are the pouches removable? A: some rifle cases have removable pouches but the named above don't because some find that feature less secure. Q: Are they made for specific rifles or can carry random riffles? A: yes to a few but most of them are designed to carry random guns together with gun accessories, therefore, they are flexible. Well, where there is a will there is a way. We are sure you did not come all this way just to settle for a mediocre rifle case. Pick something that represents you. Invest in a case that you feel it's perfect and caters for all of your needs. For instance, the ones you've seen above, they've been tested for safety, are spacious, durable and can attend to more than your dreams at an exclusively friendly price.